We had a customer come in with a bunch of random diamonds wanting them to be incorporated into a Scrolling Flower Wedding Ring. It ended up being 8mm wide and having 13 stones in it. If you have a different pattern you want used, we could use that as well. And the stones are optional if you don’t want them. STONES: Around 1/4 TCW, depending on the size of the stones. The listed price is for a Sterling Silver Scrolling Flower Wedding Ring with CZ. Contact us for other pricing options. 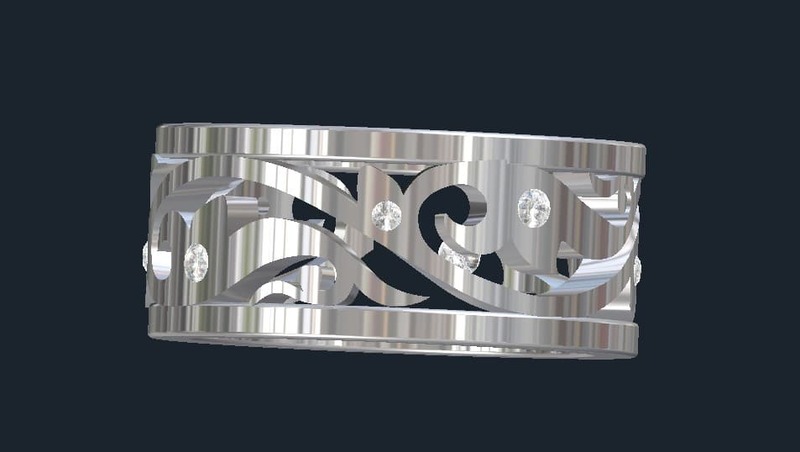 Click HERE to see another Scrolling Flower Wedding Ring or contact with your custom wedding ring idea.